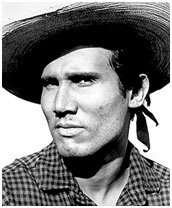 Of Puerto Rican heritage, Henry Silva can testify the three thousand miles that separate Brooklyn, NY (where he was born September 23, 1928), and Hollywood, CA, are filled with heartache, hardship and hard work. His merchant marine father deserted he and his mother before Henry’s first birthday, leaving him with none of the luxuries of life. Knowing he wanted something better, he quit Haaren High School after one year, supporting himself as a dishwasher, waiter and eventually a longshoreman on the New York waterfront while attending drama classes. His acceptance into the prestigious Actors Studio studying with Lee Strasberg was the turning point in his life. Silva worked in summer stock in Westport and the New Hampshire Theatre In the Round. He was married during this period to Mary Ramus but they divorced in 1955. His key role of dope peddler “Mother” in “A Hatful of Rain” on Broadway brought him to Hollywood for the film adaptation. 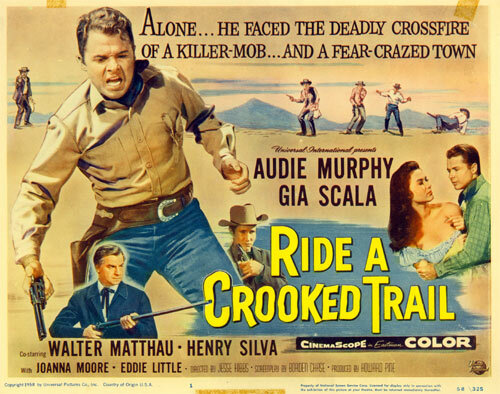 His hollow-cheeked, menacing look quickly gained the 6' 2", Silva heavy roles in a succession of westerns such as Budd Boetticher’s excellent “The Tall T” with Randolph Scott, “The Law and Jake Wade”, “The Bravados”, “Ride A Crooked Trail”, “The Jayhawkers”, “Sergeants Three” and TVers like “Hotel de Paree”, “Stagecoach West”, “Wagon Train” and “Stoney Burke”. 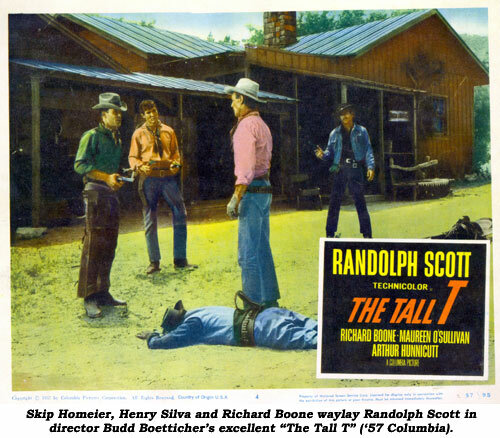 The westerns were interspersed with sadistic punk roles on “The Untouchables”, “Alfred Hitchcock” and others. After superb performances in “The Manchurian Candidate” (‘62) and “Johnny Cool” (‘63), an Italian producer made Henry an offer he couldn’t refuse—to star as a hero for a change. Moving his family overseas, “Uh Fiume di dollari”—“The Hills Run Red”, a ‘66 spaghetti western—made him a hot box office commodity. Speaking flawless Italian and Spanish helped establish Silva in a succession of European films. Over the ensuing years he worked on both sides of the ocean, continuing to essay evil in U.S. TV westerns such as “Daniel Boone”, “Laredo”, “Cimarron Strip” and “High Chaparral”. Silva was married again in ‘66 to Ruth Earl, but they separated in ‘87. A dedicated jogger, Silva puts in five miles a day to keep in shape.